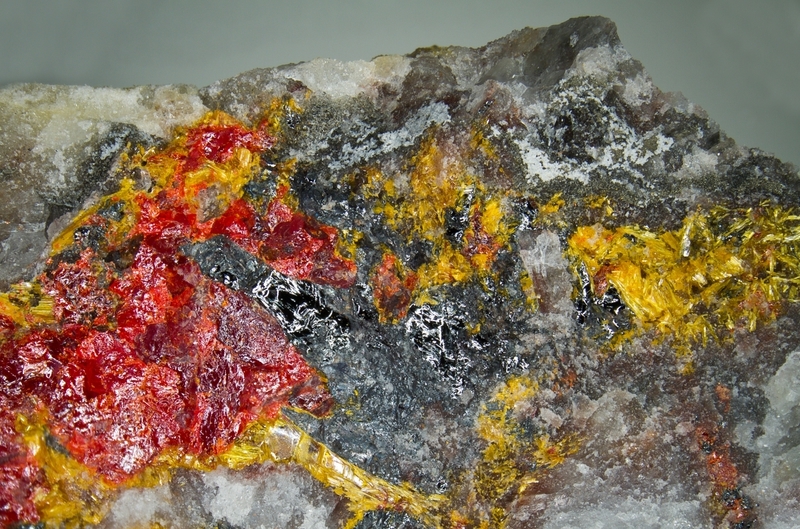 Chabournéite: Mineral information, data and localities. Also given as Tl21-xPb2x(Sb,As)91-xS147 (x = 0-17.5). For Chabournéou Glacier, near the type locality. 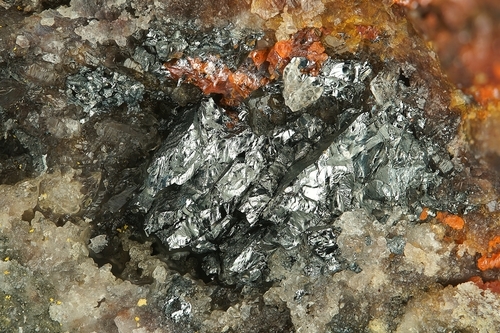 Sb-dominant analogue of dalnegroite. Compare 'UM1982-10-S:AsSbTl'. Structurally related to the Sartorite Group. Bonaccorsi et al. (2010) give P-1 and different cell: a 8.150(2), b 8.716(2), c 21.579(4) Å, α 85.18(1)°, β 96.94(1)°, γ 88.60(1)°, V = 1515(1) Å3. This phase later became protochabournéite. For Pb-rich chabournéite (empirical EPMA-derived formula: Ag0.04(1)Tl2.15(2)Pb0.64(1)Sb5.12(1)As5.05(1)S17.32(5)), Biagioni et al. (2015) give a = 8.5197(4), b = 42.461(2), c = 16.293(8) Å, α = 83.351(2), β = 90.958(2), γ = 84.275(2)°, V = 5823(3) Å3. 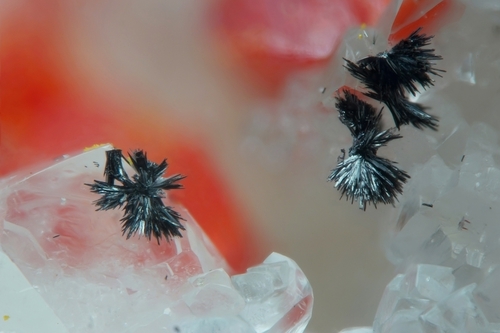 Sartorite Group A group of chemically and structurally very complex sulphosalts which are impossible to identify visually. Realgar 5 photos of Chabournéite associated with Realgar on mindat.org. Wakabayashilite 4 photos of Chabournéite associated with Wakabayashilite on mindat.org. Johan, Z., Mantienne, J., Picot, P. (1981): La chabournéite, un nouveau minéral thallifère. Bulletin de Minéralogie, 104, 10-15 (in French). Nagl, A. (1979): The crystal structure of a thallium sulfosalt, Tl8Pb4Sb21As19S68. Zeitschrift für Kristallographie, 150, 85-106. Bonaccorsi, E., Biagioni, C., Moëlo, Y. & Orlandi, P. (2010): Chabournéite from Monte Arsiccio mine (Apuan Alps, Tuscany, Italy): occurrence and crystal structure. 20th General Meeting of the IMA (IMA2010), Budapest, Hungary, August 21-27, CD of Abstracts, p. 714. Biagioni, C., Moëlo, Y., Favreau, G., Bourgoin, V., Boulliard, J.-C. (2015): Crystal structure of Pb-rich chabournéite from Jas Roux, France. Acta Crystallographica, B71, 81-88. Mem. Bur. Rech. Geol. Minière,(1977) 90, 1, 115; Bull.Minéral. (1981) 104, 10-15; Johan, Z. & Mantienne, J. (2000): Thallium-rich mineralization at Jas Roux, Hautes-Alpes, France: a complex epithermal, sediment-hosted, ore-forming system. J. Czech Geol. Soc. 45, 63-77; Biagioni, C., Moëlo, Y., Favreau, G., Bourgoin, V., Boulliard, J.-C. (2015): Crystal structure of Pb-rich chabournéite from Jas Roux, France. Acta Crystallographica, B71, 81-88. 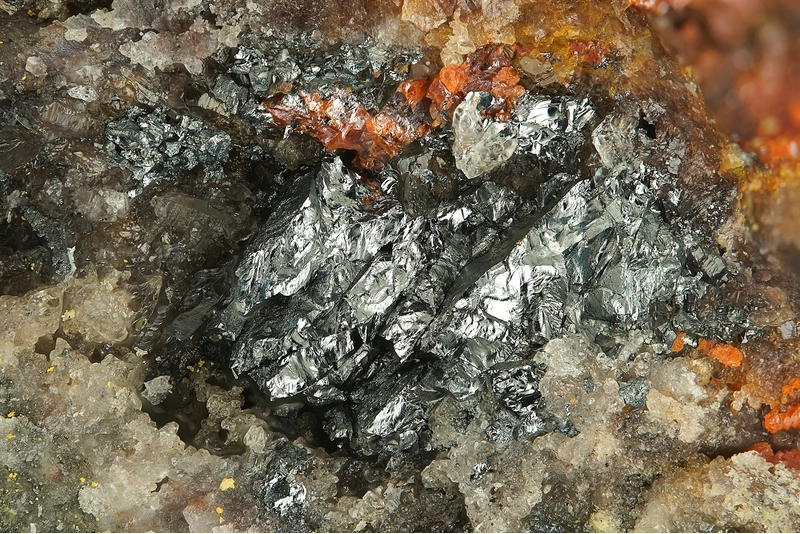 Biagioni, C., Moëlo, Y., and Zaccarini, F. (2017) Ferdowsiite from the Monte Arsiccio mine, Apuan Alps, Tuscany (Italy): occurrence and crystal structure. Atti della Società Toscana di Scienze Naturali, Memorie, 124, 5-11. EDXS P. Roth, 1st November 2015, XRD F. Nestola, 18th October 2016. Coll. P. Roth; Roth, P. (2017): Chabournéit: eine weitere interessante Neuentdeckung. Schweizer Strahler, 51(4), 36-38 (in German and French).